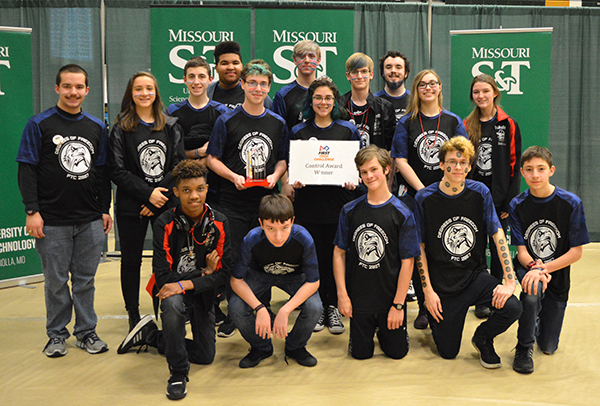 Two teams (7856 and 2867) from the Pattonville High School Robotics Club qualified to compete in the First Tech Challenge (FTC) Missouri State Championship at the Missouri S&T. Only 48 teams out of more than 200 in Missouri and Kansas qualified for state. After the state competition, Team 2687 qualified to compete at the Super Regional Championship in Athens, Georgia in March, one of only 11 to move on from the state competition. The team placed 20th at state and received the first-place Control Award, second-place Think Award and third-place Inspire Award. Team 7856 placed sixth out of 24 teams in its division. Team 2867 is show accepting the first-place Control Award at the state championship. Team 7856 placed sixth out of 24 teams in its division at the state competition.